Sample product received for review purposes. All opinions are my own. My kids and their boundless energy exhausts me. I can only handle so much time at the pool, but often times they are still begging to do something. 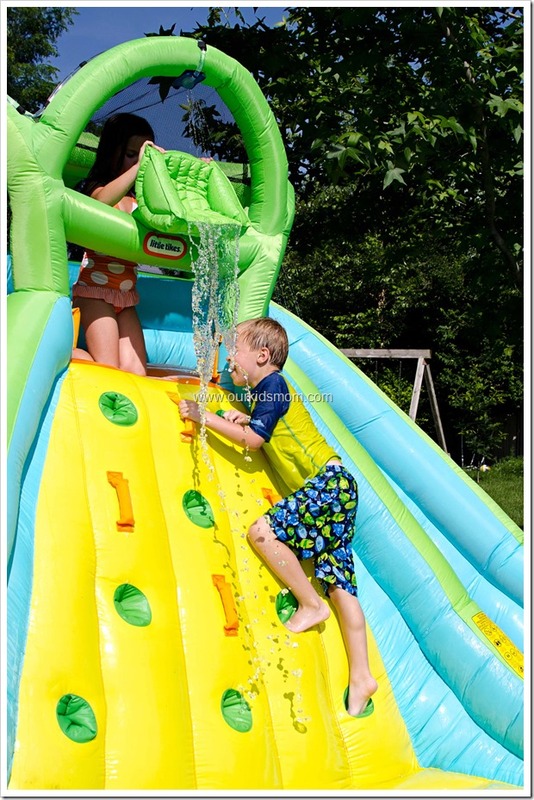 When the weather is scorching and the kids want to get wet… an inflatable water slide with two slides and a climbing wall are in order! The Little Tikes Rocky Mountain River Race looks intimidating to set up, but it’s really super easy and quick! Once out of the bag, simply unroll it and place it where you are wanting to set it up. 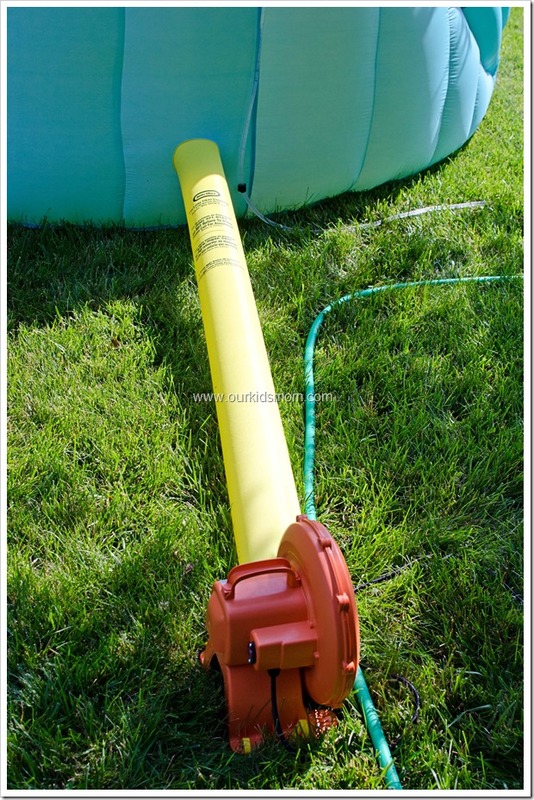 Extend the yellow tubing out and away from the bouncer and tie it to the blower with the string attached to the end. Make sure the second shorter yellow tube is tied off (you untie it when letting the air out) and turn the blower on. It takes less than a minute and the entire bouncer is completely inflated. Thread the water tubing up the side and attach with the Velcro straps that are already attached to the sides of the bouncer. You will know you have everything positioned properly because the spray hoods will line up correctly. These attach on with a larger pad of Velcro. 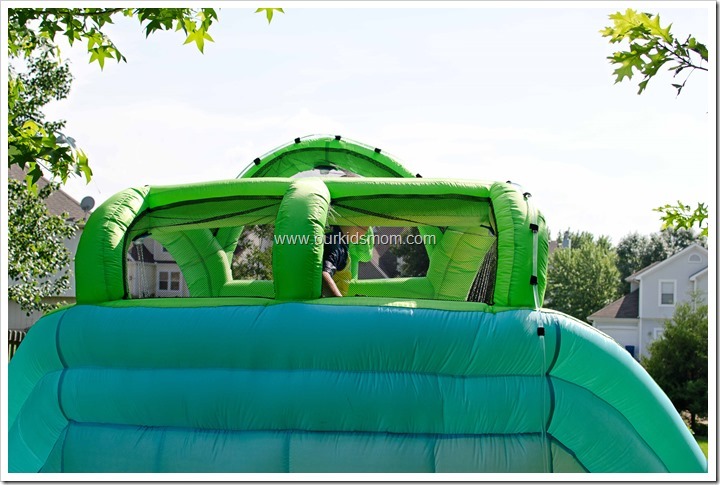 As you can see from the backside view of the bouncer, the tubing goes up the right side, over the center and ends on the left. There are three spray hoods, one for each slide to keep the surface slippery, and one in the center to fill the “surprise” dump bucket. Once you have everything set up and anchored down you turn the water on and you are ready for some fun! 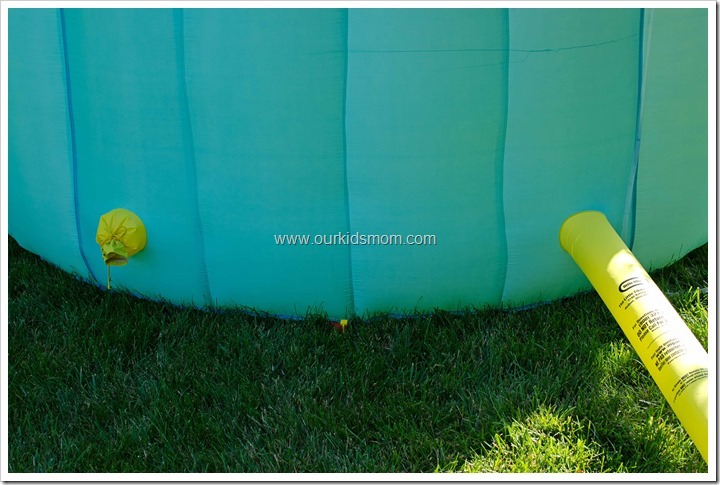 The blower will run continuously while the children are playing to keep it inflated. The main access to the slides is by way of the center wall. There are several foot holds as well as handles to grasp during the climb to the top. Neither of my children had any issues climbing up the wall and actually got fairly quick at it with time. Because the Rocky Mountain River Race is large enough for multiple children they decided immediately that they were going to make a game of racing to the bottom. My kids did this for hours without tiring. They even groaned when I told them it was time to come in for dinner. 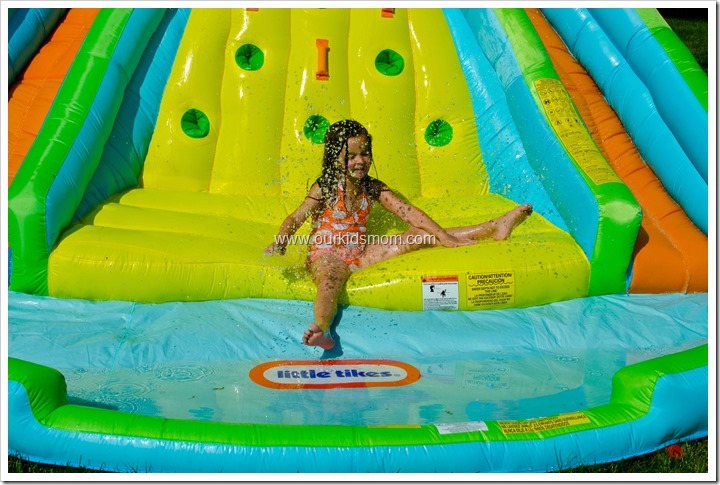 Water slide bounce house toys are perfect for keeping cool and getting some exercise while having fun! The entire bouncer is durable, colorful, and well-designed. My main fear was that it was going to be too heavy for me to lug around and set up alone. Although it does weigh in at 50 pounds, I was able to set it up without help easily. The “surprise” dump bucket collects water until it reaches the tipping point, and then pours water on kids climbing up the center inflatable rock wall. Of course my children found the way NOT to wait and started pouring it on each other. The slides lead to a large splash pool that collects water as the bouncer is being used. You can see in my photo above that our “pool” was a little lopsided. It is suggested to set your bouncer up on level ground. As my entire back yard is on a slope, this was not possible. I did my best to position the bouncer so the water would collect evenly in the middle as the longer it was used, the more the pool filled up. My children always try to find a non-traditional way to use a product. With this particular bouncer, they found that if they slid down the middle (the climbing wall) they would land on the yellow bouncy part at the bottom. Emma is doing this in the photo above. The bounce back up is enough for them to regain their footing, which they thought was hysterical. When you are finished bouncing for the day, turn the blower off long enough for the collection pool to drain. Then move the bouncer to a dry patch and turn the blower back on until the bouncer has aired out. This will take approximately 2-4 hours. The photo above is of our yard after an afternoon of play. 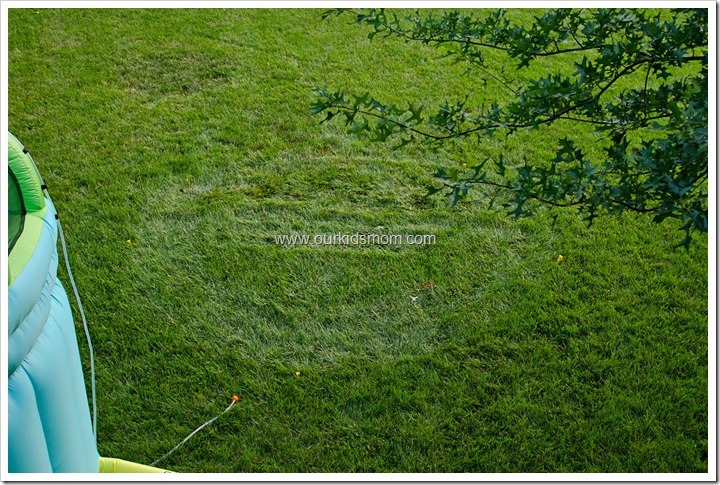 As you can see, the grass is matted down, but not damaged. Once the area dried out overnight the grass bounced back and you couldn’t tell where I had set up the bouncer the day before. If you are worried about damaging your grass, I would strongly suggest you not leave your bouncer set up for several days. The Rocky Mountain River Race is designed for children ages 5 – 10 and use with up to 4 children with a maximum combined weight of 350 pounds. I have seen more children on this particular bouncer, but again it’s not recommended. As my children and their friends only weigh in at around 50 pounds each, I foresee Ethan having a small birthday party with about six children playing on this next month. I can’t recommend this bouncer enough. It’s totally transformed my “I’m bored” couch potato kids into active bouncing and sliding kids. 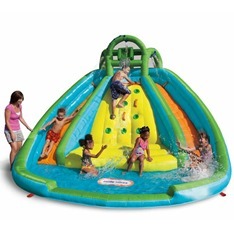 ONE OurKidsMom reader is going to win a Little Tikes Rocky Mountain River Race! This giveaway ended at 11:59 PM EST on July 20, 2014. I’d love to have the 6-in-1 Towncenter Playhouse, too, for my grandsons! My kids would LOVE the big waffle blocks! It would be nice to have one of their sort and store toy chests! My daughter would go bananas for this! I’d love to get the Super Spiral Bouncer! 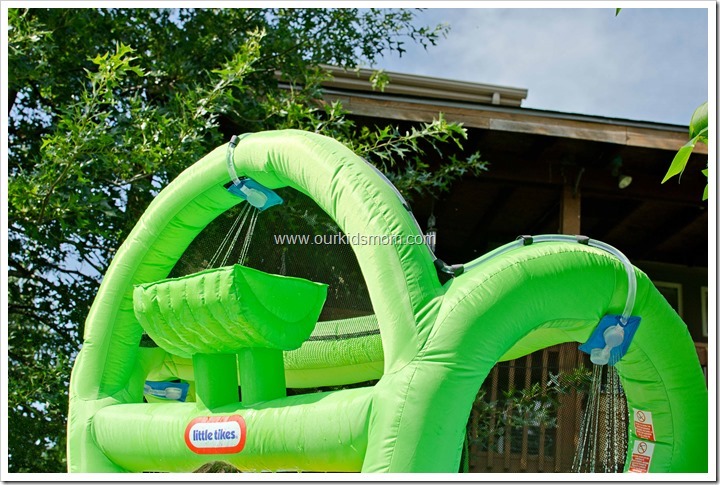 We have the Little Tikes 8×8 bouncer so I know my kids would LOVE something with a slide! It’s nice to see a higher age limit! How awesome! I think the 2-in-1 Wet ‘n Dry Bouncer would also be amazing to own, I don’t think my kids would EVER come inside! Love the slam and curve slide! The Big Waffle® Blocks look like so much fun! I like the Slam N Curve Slide! I like the Lalaloopsy so cute playhouse. I would love to get the Activity Garden Rock ‘n Spin as a gift for my expectant daughter. The Little Tikes Rocky Mountain River Race actually looks like something my boys would LOVE to play with. It gets so hot here in Florida and this is a wonderful way to cool off while keeping them moving! I love the red corvette bed! The Extreme Coaster would be neat! the slam and curve slide it looks like so much fun. 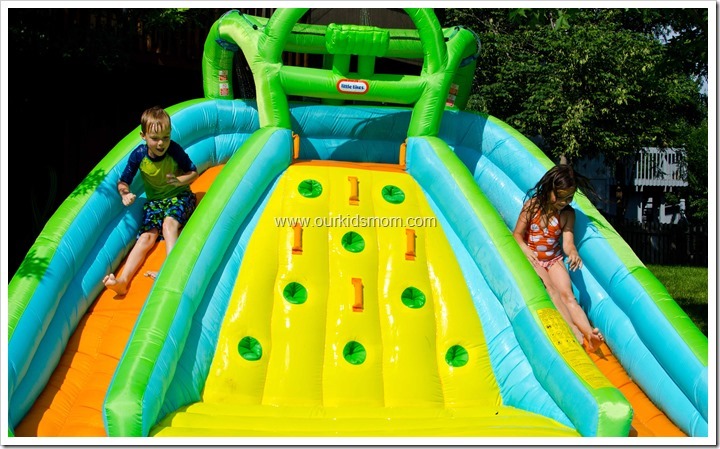 I would love a swing set with a slide for my back yard…to go along with my new Rocky Mountain Water Slide Bouncy of course! I like the playhouses. I always thought that these were neat and I would have loved to have one of these when i was a kid. OMG this is so cool! It helps them with active play and having fun outside. 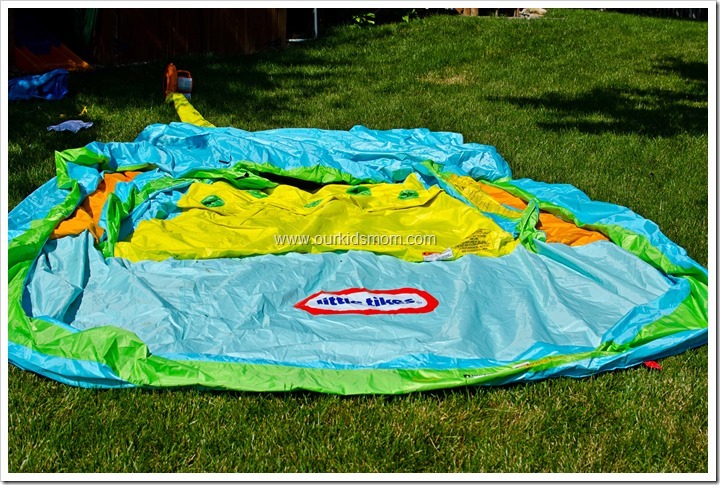 I learned that it includes a 90 Day Limited Warranty from date of purchase on polyester inflatable fabric bouncer. I want the fun house bouncer. My son would flip for the Pirate Ship toddler bed!! I love love love their outdoor toys; I’d also like to have the Turtle Sandbox. My peanut loves sand as much as she loves water! I also like the Clubhouse Swingset. I know that my grandsons would truly love this, I would like to give them something to do at my house for a change. The water slide would sure be nice for my great grandsons, I don’t have much in the way of toys for them to play with, this would make up for that, it looks great, and they would enjoy so much. My sons would love this, I have 3 boys, and my brother-in-law has 2, they would all love this, really would keep them occupied all in one area, that’s great for me. We are looking for a new bed for our daughter’s bedroom and she would love the Purple Storybook Cottage™ Twin Bed! I so want one of those slide/pool things for my kids. They would go crazy for them! I like the cook and grow grill and the little tikes playground. I love the 8 in 1 adjustable play set. I love the little picnic tables. It would be fun for the kids to eat outside or to do art projects. I would love how the table would be easy to clean up! I also love the Fun House Bouncer! I want the Endless Adventures® Playcenter Playground. I’d love to get my newest little guy a Cozy Coupe. Thanks for the chance to win! I want the Deluxe Home & Garden Playhouse from their site. 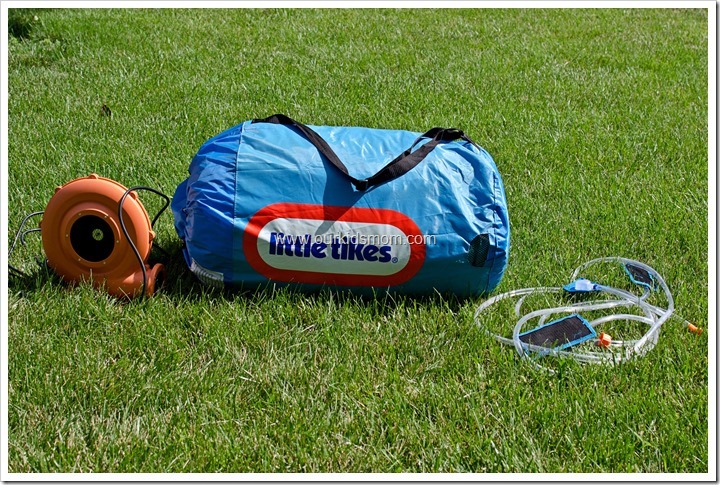 Love the great product info on the little tykes site! Really easy to quickly find out the product dimensions which is totally critical! I liked that more than one child can comfortably play on it. I like that it comes with a blower 🙂 makes for easy set up. I like the 6-in-1 Towncenter Playhouse. I like the Tree House Swing Set. I would also like to get the kids the 2 in 1 Wet n’ Dry Bouncer. I didn’t know they have one like that now, we like the Slam ‘n’ Curve Slide too. I found out they also make rain barrels! Kids would love the Easy Adjust Table. I would love to also get the Endless Adventures® Tikes Town™ Playhouse. 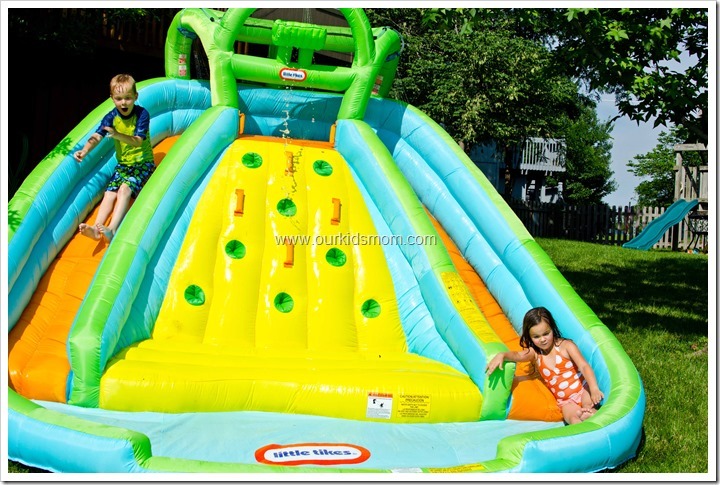 this is good for kids 5-10 my two boys would just love to play on this for HOURS all summer long! My twin boys would love this, as well as our neighbors kids to, we live in a small town, less than 500 people, so this would be a win for all the kids. My great grandsons would love this, I would love to give this to my grandson for the boys, their birthday is coming up in July. 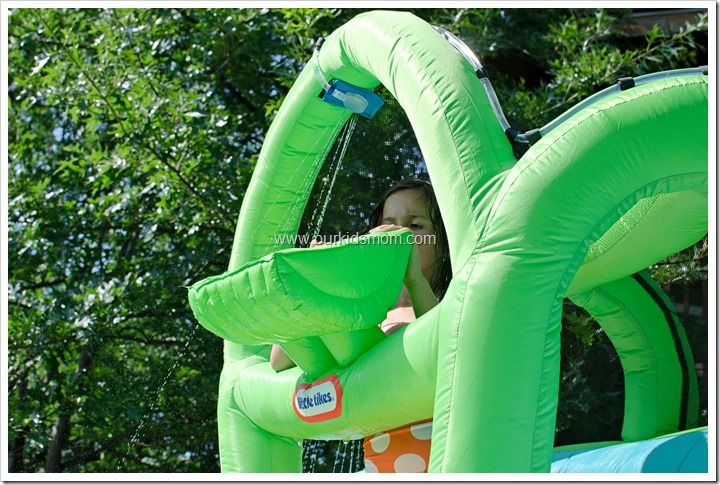 My grandsons would have a blast in this thing, they love the water, it would probably keep them busy all day. I would love to have the Little Tikes Playground. Something I would like to get from the Little Tikes store is the Little Tikes® Party Animals Area Rug. I don’t know if my child or I would love this more!!! I want it so bad! I like the Fun House Bouncer! I also like the Slam N Curve Slide! I’d love to have the Garden Table for my son. My niece would go completely crazy for this! I want the Zoo area rug that is on clearance and the picni table. My grandsons would get a kick out of this, they love the water. There isn’t anything that I don’t like at Little Tykes, but I know my great grandsons would love this, I don’t have alof for them to do when they visit. My sons would have a ball playing on this, we have a big backyard, plenty of room to set one up, the Little Tykes site has so much stuff to chose from it’s hard to make a choice. I would love a wagon or the easy adjust table. I’d like the Sand and Sea Play Table! Love the pirate sandbox! It looks fun! I like the Tikes Tough™ Workshop! The Big Adventures Action Fliers looks like fun. I would love to have this to play with my son and neighbor kids! I learned they have age appropriate toys for kids of all ages. I like the Lil’ Wagon. I would love to have the Endless Adventures® Playcenter Playground. I like the Ride & Relax Wagon. I learned that the age group for this slide is 5-10 years of age. I also like the Slam ‘n’ Curve Slide. I would also love to have the Adjust and Jam Basketball Set for my little guy. I learned they have a trampoline! My twins would love the Super Spiral Bouncer! Hoping to win this for my great grandsons, there are so many things on the site I would love to win for them. My sons are so excited that I am entering this contest, lets hope my luck is with me. I love the Climbing Towers Playground Bundle! I like the outdoor toy storage. I need one of those! I would love the Clubhouse Swingset for my children as well! 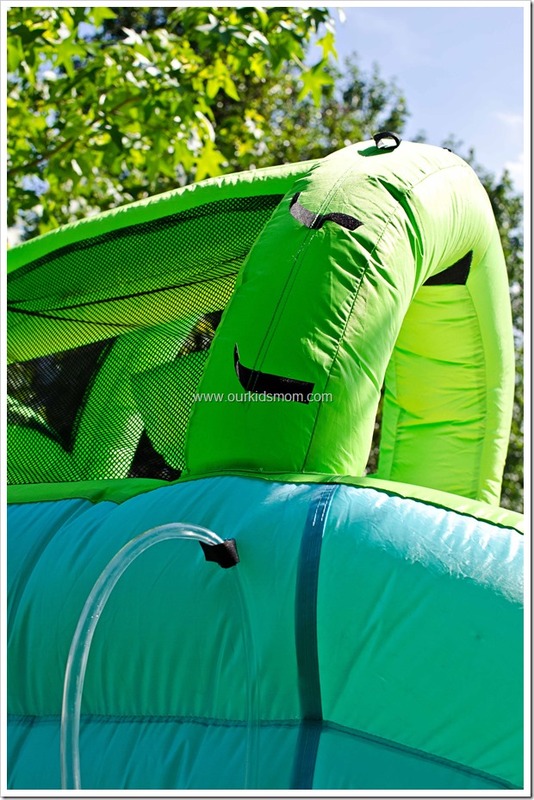 I would love to have the 2-in-1 Wet ‘n Dry Bouncer for my kids! I love the cute clearly sports bowling set! I really like the Green Jelly Bean Hopper. I love the pirate ship bed. Pirate Ship Bed is amazing! I like that it has a weight limit of 350 and it can hold up to 4 kids. This would be awesome for the nieces. I learned that this product has excellent reviews and fits into my son’s age group. I enjoyed reading your blog. I really like how this can hold older kids (up to 10 years). I had something similar (not the trusted Little Tikes brand) and it was for younger children. Once my son got a little older, it was no longer useful to us. I also like how the Velcro is reinforced. This is a great feature with kids jumping/bouncing on it. Thanks for the blog! I also like the 2-in-1 Wet ‘n Dry Bouncer. It’s becoming more and more important to me that I buy products that are made in America. It looks like Little Tikes products are. the 2 in 2 wet and dry bouncer! 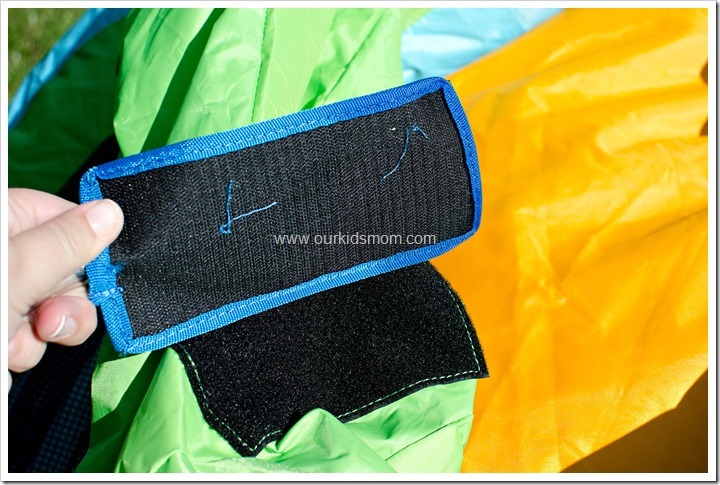 The 2-in-1 Wet ‘n Dry Bouncer is really cool too! I really want one of the wagons! I love the Cozy Coupe. My kids want the Grand Lifestyle walk in kitchen. I like the classic castle and the corvette bed. I will definitly be investing in a princess cozy coupe swing!! I know a little someone who would love the Pirate Ship Toddler Bed. I love the pirate ship bed and so much more. I want the Fun House Bouncer for my daughter. The sort toy chest would be so awesome to have! So many little toys that could be organized!! I love the Slam ‘n’ Curve Slide, my kids would too! I love the picnic table with umbrella. I love the Explorer Wagon with Umbrella-looks fun! I’d love to have the Deluxe Ride & Relax® Wagon with Umbrella for my grandsons, too. There are so many things I want from Little Tikes! We would love to also have the Pirate Ship Toddler Bed!! I love that Little Tikes makes it easy to find age appropriate toys for all ages! I like the Little Tikes 7′ Trampoline. I love the purple storybook cottage. I would love the Little Tikes® 3 – Foot Trampoline for my son. My twins and little girl will literally cry for this, lol…among other things. I’ve always loved the Cozy Coupes – but I bet my boys would love to have the Endless Adventure Tikes Town Playhouse – so cute! I also like the Little Tikes Clubhouse Swing Set. The 4-in-1 trike is nice. I would absolutely love to get my kids the Classic Castle!!! I like the Tuff Tikes™ Rain Barrel Sandstone. My kids would love to have the Picnic on the Patio Playhouse! This would be PERFECT for our annual block party! We would also love to have the 2-in-1 Wet ‘n Dry Bouncer! The pirate ship bed is cool. We really want the water slide though! The Endless Adventures® Playcenter Playground Bundle looks super fun! I like the Endless Adventures Tikes Town Playhouse. My daughter would love it! I want the 2-in-1 Wet ‘n Dry Bouncer. I want the Design Master Studio™ Desk for my daughter. I want to buy the Home & Garden Playhouse! I love the higher age limit…especially with a wide range of ages in kids! I like the rock climber & slide. 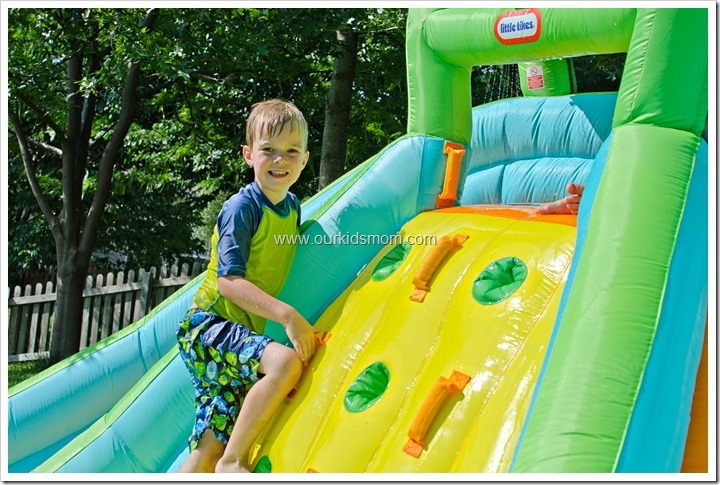 I loved the bounce house water slide review, great pics and content!